Image City Photography Gallery's current exhibit is our our sixth annual juried theme show, The Magic of Light. More than 170 photographs by 83 photograhers were selected from the numerous entries. Jim Patton and David Perlman are featured with a vibrant exhibit in the East Gallery. We have had numerous comments praising the talented photographers -- "Wow! ", "Love it!! ", "Beautiful! ", "Great Show! ", "As always, so glad we came to see the show!." Gil Maker, Chairman of the Exhibit, has observed that "The juried show just keeps getting better and better. We have photographers entering from Michigan, the Adirondacks and the Hudson Valley as well as the local and Finger Lakes region. We have a great mix of returning photographers who have been in previous exhibits as well as many joining us for the first time. We appreciate the support given to the Gallery by the photographers as well as the huge number of visitors during the show. We are very pleased at how it all came together." Sunset Through the Front Door , by Bonnie Gamache. "This is a superb image which employs an abstract view of an everyday feature of a home...the front door. 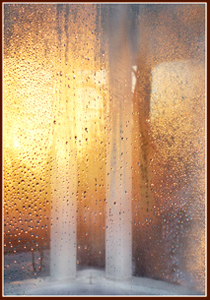 Strong upright elements tempered with water droplets enhance this wonderful composition. The use of muted, pastel colors make for a very inviting image. Without looking at the title the viewer is free to interpret the image in many different ways....the twin towers? light beams? This is the mark of a strong abstract image...beauty of color and composition coupled with a lack of clarity of what one is looking at....so that the mind is freed up to imagine. Once the title is read then the appreciation of how the subject was captured adds to the enjoyment in lookling at this image." Peek-a-Boo , by Julie Jacobs. Strong vibrant colors and a whimsical frog make for this image's strong appeal. The composition makes the viewer move their eyes through the image until the frog is noticed and sets the focus. 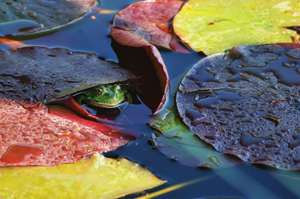 Autumnal colors of the Lilly pads make for a complement to the green patina of the frog. This happy photograph shows nature in a microcosmic manner....focusing on a small detail that could easily be overlooked during a casual walk by a stream. Little Red Boat House by Carolynn McCann. "This image expertly combines classical compositional tools to make for a very effective result. The "s" curve of the stream leads the viewer's eyes to the little red boathouse. The only strong color in this image, the red of the boathouse grounds the image. The photographer uses a very thin red double mat to emphasize the solo red color in the image. 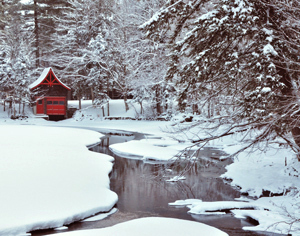 Taking this photo in the winter allow the photographer to be able to have minimal landscape colors, allowing for the boathouse to draw one's eyes so expertly." For full details of the show click here. Be sure to check out the link to the Gallery Award webpage in addition to the "Preview of the Show Gallery" to see a selection of the fine works in the show that runs through Sunday, January 20. Peter selected a Maria Dunaevsky photograph noting "The immediate impact to me in this creative print is threefold. Certainly one should admire the lovely color palette, particularly highlighting the reds and pinks from the powerful reflections, the back pack over the girl's shoulders, all the way to the facial colors of the image on the brick wall. 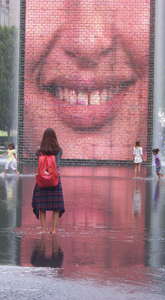 With a fountain erupting behind the apparent brick facade, there is a mystery quotient here as to whether the face detail on the wall is painted or as a result of a projection from an unknown source. What is striking to me is that this exquisite image really captures 3 stages of life,all represented here by females. Firstly, the young children are joyfully playing in the water and fountain display. In the center the young teenager is standing barefooted in the water, apparently watching over the children's safety, or may be just there as a bystander. Here she is transfixed by the image on the wall, initially being intrigued by what she is looking at, and then puzzling at the somewhat cynical look on the lady's face. Surely this is an adult face questioning the future of all who may stop long enough to try and analyze the expression. Certainly this young girl has reason to doubt what the future may hold for her A fascinating image, aesthetically seen and recorded." 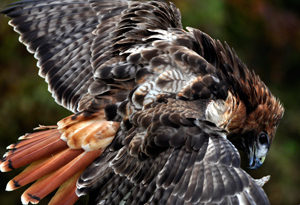 A second choice was Red Tail Hawk by Jill Frier. Peter observed that " This is a truly spectacular close-up of a majestic bird of prey. The superb lighting impressively delineates the astonishing detail and pattern of the hawk's outstretched wings, such features rarely seen or recorded so dramatically. The color palette is equally awesome, highlighted by the gorgeous red tail feathers which give this magnificent bird its imposing name. Not only does the magical lighting allow one to experience and almost feel the intricate feather structures, it also sweeps one's eyes remarkably from the tail all the way to the head and curved beak, creatively illustrating one of nature's imperial and most beautiful raptors." their own imaginary world, hopefully before they have read what I saw in this elegant field of sunflowers." With the choice of the photo by Tim Fuss, Peter noted that "T his is a delightfully refreshing image of a delicate spray of pink leaves, possibly bougainvillea, on a slender stem displayed behind what looks like a white curtain suspended across a window frame. The gently curving assembly is deliberately recorded out of sharp focus, to give the charming and delectable effect of an impressionistic painting. 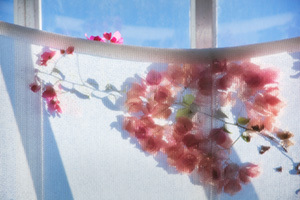 The soft pastel colors radiate peace and tranquility against the curtain and light blue sky beyond. It is intriguing that the delicate arcs of the branch and curtain complement each other wonderfully, especially against the bold vertical window elements. The only mystery that remains to be answered is as to why the artist detailed a very small leaf detail peeping above the curtain. This part of the plant is in sharp focus, and is obviously deliberately shown as such. Whether one likes this feature or not, the overall image is just beautiful and artistically seen and recorded." Nan Guzauski's Sunny Ward is another of Peter's Picks. He comments that " Nancy always has a powerful and unique way of capturing the sadness, despair and poignancy in her images of abandoned mental and health institutions. 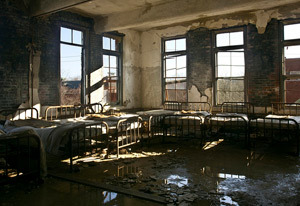 Here in the corner of a large room, is a stark setting of patient's beds pushed tightly together, under the glare of curtainless windows, and a debris-filled floor, where water from a burst pipe or open window is relentlessly making its presence felt. It has been countless years since these beds were occupied, now they are just locked together, probably waiting the wrecker's ball to wipe away all memories of this needed facility. Although one could write paragraphs on what may have transpired here long ago, one should turn to the brilliant light that is coming in through these once impressive tall windows. Although we are sadly illuminating the past, one should use this opportunity to look into the future. It may not be appropriate to imagine if any of the patients housed here would still be with us, though one certainly would hope that some are. Instead, one should think positively that these institutions have been replaced by modern facilities that really do meet the challenges of health and rehabilitation of people who are mentally challenged." 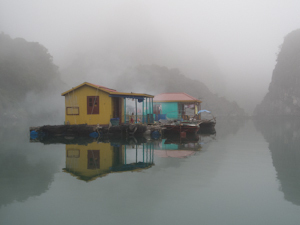 Next, in alphabetical order, Joyce Pearson's Floating Village was selected -- " In bright sunlight, this enchanting image would lose most of its impact, but in the fog and misty surroundings, this oriental setting takes on a mystical aura of its own. There is a peacefulness and tranquility that is just awesome, making the viewer want to take on a magical mystery tour to learn more about the people and their way of life on this waterway. I am sure that life in this small village is by no means simple, and it requires long hours of hard work to achieve the small rewards that they richly deserve. One is fascinated to learn how this apparent isolation from the mainland is a forced situation or one handed down from generations. This life may be all that they have experienced, and they are probably happy if that is the case. The mystery of how these enterprising people exist is moving and inspiring , let us hope that one is experiencing a happy outcome, movingly and artistically captured by the artist. The sixth selection was Waves of Life by Elena Rey-Kautz. 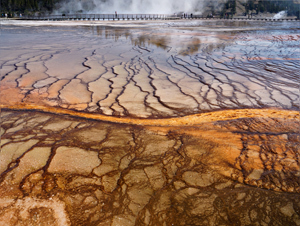 Peter felt that " This is a spectacular view of what is probably part of a geyser complex in Yellowstone, where eons of time have left a highly colorful and detailed surface landscape that is simply breathtaking. The immediate foreground is particularly impressive, where the rusty brown and yellow ochres highlight magical striations that lead dramatically to a gently curving interface, before continuing as more regular fissures into the predominantly blue lake beyond. Of particular note is that the flowing curved barrier is almost mirrored in the pedestrian walkway near the top of the frame, a passage highlighted by the steam and water vapor emanating from a distant geyser. One could easily crop away the human interference at the top, to leave a magical "scape" below that would open up many possibilities as to what one is looking at. An example could be an aerial view from say a satellite, of a large complex river estuary, where pollution in particular from a myriad of small rivers eventually reaches the ocean beyond. This print as it stands has been creatively and brilliantly captured by the artist, and it is one of my favorite images in this outstanding exhibition." We think you will agree that these are six stellar photographs and worthy of some special appreciation. The small thumbnail versions here do not do them justice. If you haven't visited the show yet, these photographs should whet you appetite for the full exhibit collection. Image City is proud to announce that the show beginning February 20th is our 100th exhibit. As it happens, this is also the Peter's Picks Retrospective - 2011 show. To commemorate our 100th exhibit we have produced a limited quantity of T-Shirts with our Image City logo on it together with an embedded 100. These are unique and we don't plan to produce any more, so you may want to grab one for yourself at $20 including tax. Image City Photography Gallery will be attending as a proud sponsor of the Niagara Frontier Camera Clubs' 2013 Convention. Check their website for current details. The keynote speakers are Nevada Wier, an award-winning photographer specializing in the remote corners of the world and the cultures that inhabit them, Rob Stimpson, an internationally published, award-winning photographer best known for capturing the wilds of the Canadian outdoors, and Harry Benson, with a photojournalistic look at the last 50 years. Numerous speakers at the convention have many topics of interest to photographers. It will certainly be an instructional and enjoyable weekend of Photography. Visit the NFRCC website at www.nfrcc.org/convention. All local photographers will be pleased to learn of another wonderful opportunity to submit work for the juried show A Photographer's Path 16, an annual exhibit of photography at the High Falls Gallery. In its 16th year, it is always a great exhibit at Rochester's official visitor center where the art exhibits add extra vitality to the permanent displays. Click Here for a PDF documenting the details as well as the entry form. Submissions are to be dropped off on February 6 - 10. The exhibit will run during March and April. For questions contact Sally Wood Winslow at High Falls Gallery 325-2030. For the photographers currently exhibiting in The Magic of Light 2013, please note the request "We respect and support the exhibits of Image City Photography Gallery, but, images displayed in the recent The Magic of Light exhibit will not be accepted for display in A Photographer's Path 16." In that way the their new show at High Falls will meet their goal to create the freshest show possible.